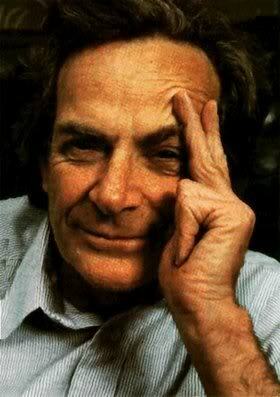 You are here: Home / Climate / Richard Feynman on "Cargo Cult Science"
Richard Feynman on "Cargo Cult Science"
But there is one feature I notice that is generally missing in cargo cult science. That is the idea that we all hope you have learned in studying science in school–we never say explicitly what this is, but just hope that you catch on by all the examples of scientific investigation. It is interesting, therefore, to bring it out now and speak of it explicitly. It’s a kind of scientific integrity, a principle of scientific thought that corresponds to a kind of utter honesty–a kind of leaning over backwards. For example, if you’re doing an experiment, you should report everything that you think might make it invalid–not only what you think is right about it: other causes that could possibly explain your results; and things you thought of that you’ve eliminated by some other experiment, and how they worked–to make sure the other fellow can tell they have been eliminated. Details that could throw doubt on your interpretation must be given, if you know them. You must do the best you can–if you know anything at all wrong, or possibly wrong–to explain it. If you make a theory, for example, and advertise it, or put it out, then you must also put down all the facts that disagree with it, as well as those that agree with it. There is also a more subtle problem. When you have put a lot of ideas together to make an elaborate theory, you want to make sure, when explaining what it fits, that those things it fits are not just the things that gave you the idea for the theory; but that the finished theory makes something else come out right, in addition. In summary, the idea is to give all of the information to help others to judge the value of your contribution; not just the information that leads to judgement in one particular direction or another. The easiest way to explain this idea is to contrast it, for example, with advertising. Last night I heard that Wesson oil doesn’t soak through food. Well, that’s true. It’s not dishonest; but the thing I’m talking about is not just a matter of not being dishonest; it’s a matter of scientific integrity, which is another level. The fact that should be added to that advertising statement is that no oils soak through food, if operated at a certain temperature. If operated at another temperature, they all will–including Wesson oil. So it’s the implication which has been conveyed, not the fact, which is true, and the difference is what we have to deal with. We’ve learned from experience that the truth will come out. Other experimenters will repeat your experiment and find out whether you were wrong or right. Nature’s phenomena will agree or they’ll disagree with your theory. And, although you may gain some temporary fame and excitement, you will not gain a good reputation as a scientist if you haven’t tried to be very careful in this kind of work. And it’s this type of integrity, this kind of care not to fool yourself, that is missing to a large extent in much of the research in cargo cult science. « Damning critique of global warming "science"
The politicisation of science in the AGW debate is the main reason for the lack of scientific integrity as mentioned by Feynman. Take for example the term ‘carbon pollution’ – carbon dioxide (CO2), which is what is being referred to, is not a pollutant and Global Warming has nothing to do with pollution. The fact is that what they are referring to is actually carbon dioxide emissions, the gas and not carbon the chemical element. .. and yes, I agree that the Prime Ministers press release is not a scientific document however it is supposedly based on the scientific principle of AGW, but lets not let the facts get in the way of a good story!